You all know him as B. and sometimes "The Cookie Monster" but I usually call him "my better half" and I would be the first one to tell you how fitting the phrase is. When I am wild and crazy or childish as only a woman can be, he is the mature one keeping me grounded and putting things in perpective. When I am the nervous one or the mature one, he becomes the childish one and relieves tension by cracking up a joke or coming up with something fun to do. He never said a word to me along the lines of "grow up" "stop playing" or "relax"...all he has to do is to hold me. He has got my heart beating inside his. Here is one of the many examples that makes it "why it's working for us". One thing that used to get to me in our early years together was the fact that I would never get flowers, chocolate or trinkets...When I asked him why and that I was expecting at least some flowers for my birthday, he would always say "expectations will ruin your life". He would wait a day or two and give me the mot thoughtful and hip present. I would feel completely stupid of course and over the years I have known to set aside my expectations and apprehensions; he will take care of things, of people, with a lot of thought and care. I have learned not to have expectations because in the end things would work themselves out, and in the process he would allow me to grow and mature and never feel like I really was 19 years his junior. At the same time, I let him be the 15 year old he is at heart. He is constantly fixing things he finds on the side of the road: we could probably give you a couple of chain saws, electric drills and vacuum cleaners that we found while walking the dog and that he fixed back up. While I get dinner ready, he goes down to the garage and unscrews, solders and plugs things in...and puts them in the "garage sale" box. We have never had a garage sale and I don't foresee us having one soon either! I let him work through his piles and stuff because I know how giddy his little heart gets when something is plugged and actually works. Eh! I am all about free vaccum cleaners with a long haired dog!! My dear friend Zorra is hosting a Valentine's Day event and she got me thinking about what I wanted to make B. to tell him how thankful I was that he had said "I do" to the whole Tartelette package 10 years ago. We don't really do anything special on Valentine's Day, mostly because of the whole commercial aspect of it, but all the red and hearts seen everywhere lately can't but make us a little softer. I usually make him a giant heart shaped chocolate chip cookie and when he saw I was cranking the mixer one evening he asked if I was going to make him a treat for Valentine's Day. I replied "nothing that you migh expect!"...ahahaha! I learned that trick from the master himself!! 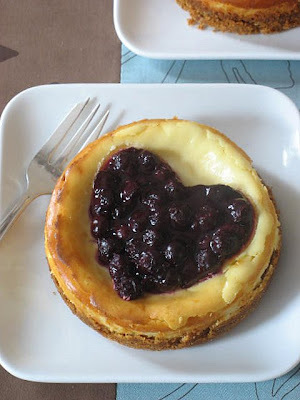 Instead I made simple lemon scented cheesecakes (4 inches round) and cooked some blueberries that I placed in a heart shape on top. He loved it...Unexpected, light and refreshing....and not chocolate!! Preheat oven to 350F. In a medium size bowl, combine the graham cracker crumbs and the melted butter. Divide among 4 mini springform pans and pat with your fingers until evenly distributed. Bake 10 minutes. Lower temperature to 325. In a large bowl, with the electric mixer or by hand , mix the cream cheese, butter and sugar. Add the eggs, one at a time until well incorporated. Add the vanilla,lemon zest and juice. Divide between the springform pans. Wrap each pan with heavy duty foil. Set them in a roasting pan, fill with water and bake at 325 for about 40 minutes, or until they wiggle just a tiny bit in the middle. They will set more after an overnight trip in the fridge. Remove the foil, let cool, and refrigerate.When ready to serve, run a hot knife on the inside of the pan and release the cheesecakes. 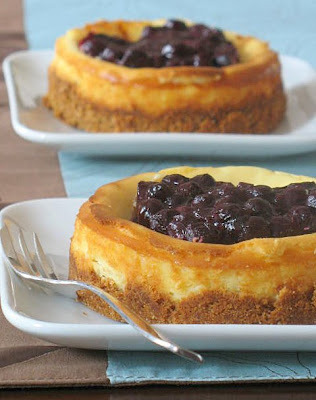 To decorate, place a cokkie cutter on top of each cheesecake and fill with the cooled blueberry topping. Let set in the fridge for an hour and slowly remove the cookie cutter before eating. In a heavy saucepan, heat the blueberries with the sugar and the lemon juice until the sugar melts and the berries strat to release their juices. Stir the cornstarch in the pan and cook until the liquid becomes clear again and starts to thicken. Let cool to room temperature. We laughed that night while eating them with my mother as she exclaimed that we were indeed easy to satisfy "give him a broken drill and you a block of cheesecake and you guys are happy as pie" and to my huband The Professor to add "would not be bad if the drill was an antique?! "...and there you go...we are indeed happy with very little. It would however make our day if you voted for me in the Death By Chocolate contest so we could say all that from Napa! Don't forget that they will also send a reader to the chocolate festival!! Blueberry cheesecakes were the very first cheesecakes I had. These are so cute! I agree with the expectations thing. They ruin everything. "Hungry" hubby and I do not expect things from each other and it does makes things more special! I just had a cannele at work... I showed it to all my co-workers ... so cute. Helen, you and B deserve all the best and are both very lucky. Especially when one of you gets treats like these! That was sooo swett... I bet he feels like he is the luckiest man on earth! And the blueberry cheesecake looks deliciuos! Cheesecakes are my weakpoint...This one looks really pretty! Your right. Refreshing and a nice change from all the chocolate. Yeah, he's adorable. Fine. I can take a hint. Just send me the cheesecakes and I'll consider a fair trade. Loving the cheesecake...though I must make mine with something other than blueberries...proabably strawberries. What a sweet story! I love reading about other couples and what makes them tick. I think I get it from my southern Grandma who was addicted to Harlequin romance novels. ha! The cheesecakes are adorable, too. Blueberries are underused on cheesecakes these days. Those cheesecakes are very pretty! Such a great idea! Petite merveille gourmande !! Juste ce que j'aime, cheesecake & blueberries! What a wonderful declaration of love! And the cheesecakes are so cute. Lucky B..
You're lucky to have each other. I love romantics, and your cheesecakes are delish!! Beautiful cake and wonderful story!!! I wish you and B. happy Valentine's Day and happiness all year round!!! How gorgeous! Lucky lucky Valentine who receives these! Your words really touched me, how beautifully put! And those little cheesecakes look great as well! Oh I love this, I love it when you can really feel that people are totally and utterly in love. We don't usually do the whole nine yards for Valentine's either but I know I married the best person for me 100%. I think you've inspired me to go make him something special, just because. Love that last photo, btw. Expect the unexpected! In all ways you always come through Helen!! Love blueberries and they can only be better on a cheese cake. But those.. those are just too cute not to eat! I really think that love like that is hard to come by. I feel as lucky as you do! These cheesecakes are adorable! What a perfect way to say I Love You. OOh how sweet Helen , B. sure is lucky to have you make him this awesome cheesecake. Unfortunately my hubby is not into anything sweet, I wish he would ask me to make him something sweet ...i'd be over the moon. Oooh this is exactly what I was looking for to make for my mother in law next week for her birthday, since she does not like chocolate! Perfect! Ah Helen, you're trying to melt my heart of ice with your stories... The cheesecakes look amazing! These are awesome, especially because I love blueberries, and I could NOT think of what to do for that event without having to go buy some kind of heart-shaped bakeware. I probably could have thought a little harder, but argh! Wonderful post Tartlette - especially the middle bit when you encourage yourself to get back to your cheesecake. :) They do look lovely, those things. Cheesecake always hits the spot! Nice heart shaped blueberry topping. Hey, so I have a question. 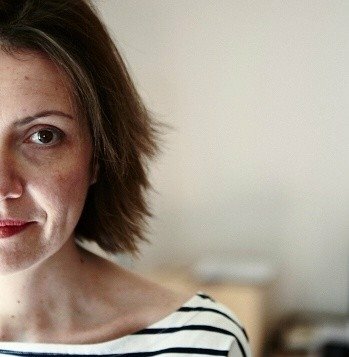 My friend and I are trying to put together a super amatuer cookbook and I'm wondering if you have any food photography tips for us. 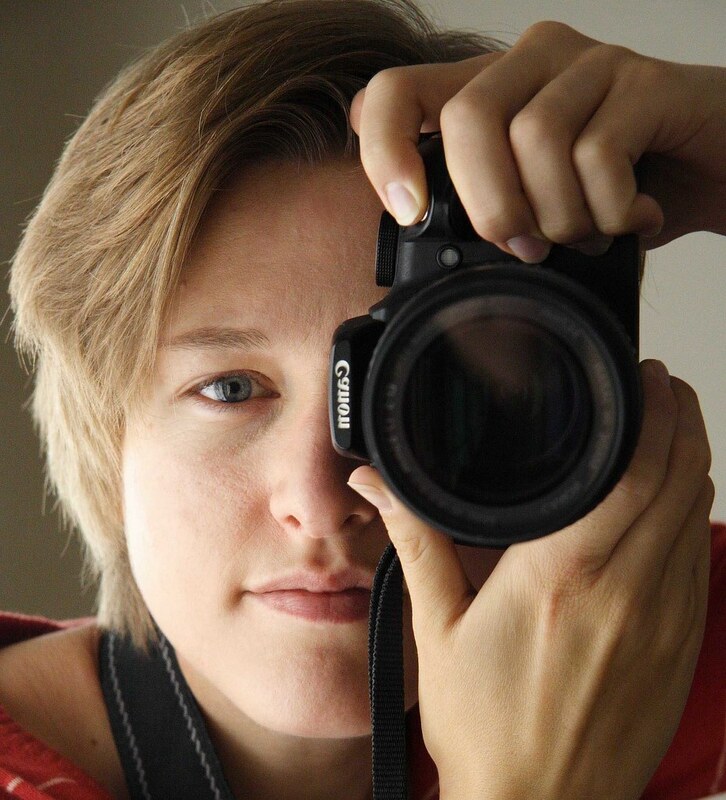 Your pictures always look amazing, and you crank them out so quickly so you must have something up your sleeve. Is it in the lighting? the camera? Or do you just have to be pure in heart? so adorable. did the blueberry stay in the nice heart shape, or did it start to ooze after the photos? you and B. both sound very lucky! UsvsFood: the cornstarch in the blueberries makes the thick enough to hold their shape for a long time after your remove the cookie cutter. No oozing, but no brick either! Clementine: no tricks up my sleeves! I have a box full of fabric, placemats, tablecloth that I buy just for the pictures. I use natural light, 2 big windows to my left. I have a basic camera (upgrading soon though) but I have learned to play with the aperture and shutter speed to take full advantage of the natural light. A tripod is essential for me as I can look at the frame and move props or dishes around without reseting the camera every time. I use Picasa to add light if I shoot something on a cloudy day. Pretty basic as you can see! I love hearing about good relationships. Your hubby sounds wonderful. The cheese cake on the other hand looks to die for. What a spoiled hubby. That looks so lovely! I didn't even know they made mini-springform pans (maybe I can maintain some portion control!!). I've got a recipe for a Chocolate Raspberry Croissant Panini on my blog and I've linked to this cheesecake recipe for those who might be interested!